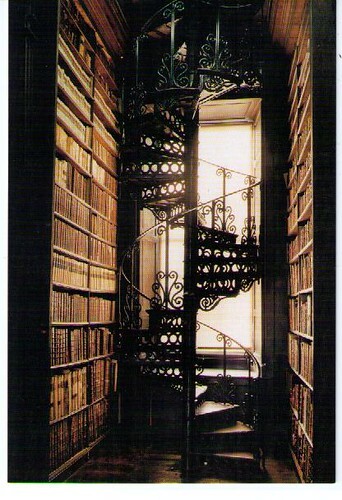 If you have been following this blog then you understand that I have an affinity for libraries. It truly does not matter if the building is purely functional and has no aesthetic beauty. That does not mean, however, that I do not appreciate the classical appeal of a truly magnificent building. Beauty certainly does add to the spiritual aura of the experience. In a building where great care and thought have gone into the planning of the layout, the grain of the cut wood, the positioning of the lighting, etc, one can be wholly be transformed. That was how I felt when I just glimpsed at the images of the Trinity College Library of Dublin, Ireland. Being Irish myself I felt a little pride when I looked through the images. I wish that I could just teleport myself there and take in the feeling of just standing in that room. I can just imagine the smell of the old books, leather and carpentry. That is the quintessential library. The amazing part of a building like this is that it can quite literally transport you back in time. Sure it is functional library with all the modern accouterments, but still the soul is still there and that is the important thing. In addition to the outstanding spirit of knowledge that the Long Room of the old library (depicted above) evokes other exhibits have graced the library. 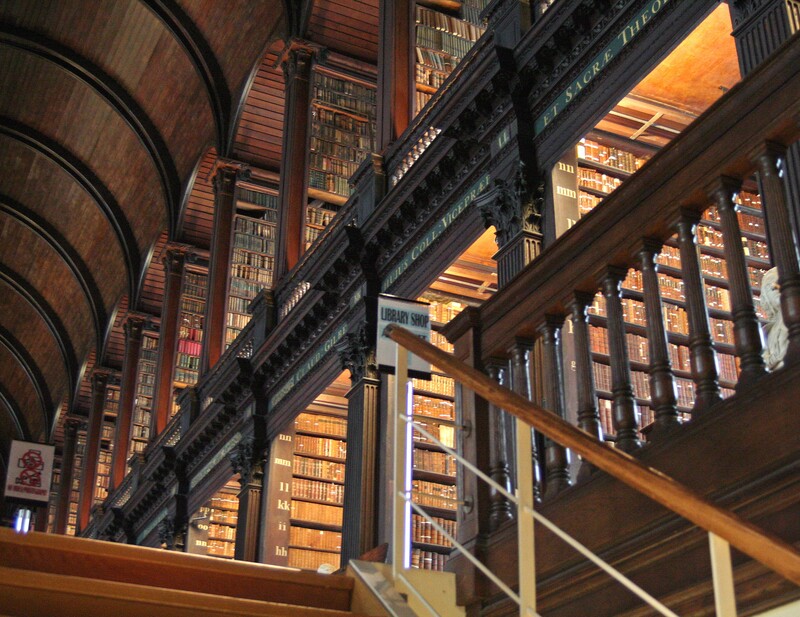 The library being situated in Dublin is at the heart of Irish culture. The most famous cultural icon of Ireland is The Book of Kells and it is housed in that very library. The Book of Kells has been on display in the Trinity Library since the early 1800's and has been in possession of the library since 1661 when the book was given to the library for safekeeping. The book itself is an vulgate edition of the gospels. The origin of the book is highly debated amongst scholars. One account has the book being written in part or full in a monastery founded by St. Columba on the Isle of Iona. Iona was an Irish settlement in Southern Scotland and a highly cultural Christian center. St. Columba was a driving force in the conversion of the Picts (His story a fascinating tale in itself.). At the time of the writing of the book Viking raiders were pillaging the rich monasteries which dotted along the coasts. As a result the treasures of the precariously positioned spiritual center of Celtic Christianity were removed and transferred to safer locations. 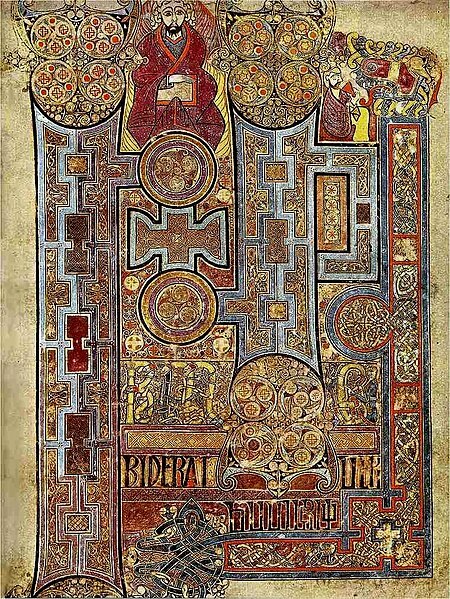 The Book of Kells was transported to the Abbey in Kells where it garnered its name. That Abbey was pillaged several times in the 10th Century by the Vikings who by then were penetrating further into Britannia. It is not known how it survived, but it did. Well, the book's luck did not last forever when it was stolen and its golden covering forcibly removed damaging the book and losing several of its folios in the process. However, it was found and returned to the Abbey were it remained until the English Civil War and the reign of Oliver Cromwell. It was during that period when the quartering of a regiment of Cromwell's cavalry in the Abbey prompted the governor of the region of Kells to move the book. The book was sent to Dublin for safekeeping. I just want to say that this library is added to the list!! I just want to say that the external photos of the building are just as cool and I invite you to take a look. Here is another rather cool link to check out detailing the establishment of Trinity College. Click Me! Here are two concepts which I am sure many of you would not mind intersecting - libraries and chocolate... yes I said the "C" word. I give you The Chocolate Library. Now before you get your hopes up, no it is not an actual library with books made of chocolate like something out of Charlie and The Chocolate Factory (of Willy Wonka fame). No its a store, a chocolate store in New York. Now I was going to be satisfied with just showing the link to the store and moving on. However, the story doesn't end there. As I was poking around the website (which sadly is just a filler page, the regular site isn't ready yet) I found some links to some articles. At first I thought they were just announcements about the new store opening up. Well it is not quite that. The articles detail the travails of the man who wishes to incorporate the store under the name The Chocolate Library. Well, in New York you can't just go and do that. Why? It is because as stated in the New York Times article, "Since 2006, state Business Corporation Law, Not-for-Profit Corporation Law, Partnership Law and Limited Liability Company Law require the education commissioner’s consent for the words library, school, academy, institute and kindergarten, among others to be used in a certificate of incorporation or company name." Well, if you are curious about The Chocolate Library here is the link. You can find the articles linked below. You can also like them on Facebook. I found something interesting that you might find interesting if you follow this blog. As the title says it is 25 of the most influential who have been a part of the profession. A few of the people who made the list may surprise you. I was. Well anyway, enjoy this link for tonight. Recently I happened upon the television show Who Do You Think You Are. It has been one of those shows which I have always meant to check out, but never actually got around to watching. Well a good friend of mine suggested that I turn it on because the subject of that day's episode, Tim McGraw was in the Library of Congress. Well, quite naturally I switched over. It is a fascinating show and I highly recommend it. I hadn't caught the part of the show where they mentioned exactly why they went there specifically, however since the Library of Congress is essentially the largest functioning research library in the world it is a choice place to look up historical records. Being exactly what it is it is safe to say it has a nice historical write up. So here is the link to get the full story. Here are a few quick fun facts on the library though. It was established in 1800 by an act of Congress to establish a library for the use of the Congress. There was no internet or nightly news. Newspapers and journalism in general was about all you had. So basically Congress needed this information nearby to be able make able decisions on the issues of the day (or so it is theorized, hah). Well anyway, The War of 1812 flares up. Washington is invaded in 1814 and the Brits burn Washington and pillage the library. Remember books were rather valuable at the time. They were not as widespread as they are now. This looks like the end, right. Well no, they would have probably gone and built another library anyway for the same reasons that they built the first. However, the Library of Congress was Thomas Jefferson's baby. He was dismayed at the loss and offered up his own private collection to restart the new library. Former President Jefferson's library was the largest private library in the U.S. at the time. It had around 6000 books. Many of which were rare volumes. There was one hitch though and this really changed the original mission of the library. President Jefferson's library was more wide-ranging in its subject matter. The original library was purely reference. The Jefferson library contained books on religion, philosophy and art amongst others. Eventually the Congress accepted President Jefferson's offer on the basis that it wasn't really known what subjects would be called upon for research. Thus, the true Library of Congress was born. Today the library has 883 miles in shelving. It has 144 million items in stock with 33 million books in 460 languages. All this started with an initial grant of $5000 in 1800. As some of you may have noticed my blog has been on a little unintended hiatus. I've been settling into a new job and I recently moved, so I have been a little busy. Well, so long as life remains at bay for a while I should be able to get this project rolling again. I still intend to do what I set out to do when I started all this. Winter seems to have abated somewhat, so hopefully I should be able to get out and hit a few libraries. I'd like to hit one a week, we'll see on that. Once the local libraries are exhausted the further out ones will take a little planning. My GPS will certainly be working overtime. Anyways, it is good to be back!